Reflective beam integrators are widely used in high-power lasers for welding, cladding, and heat treating applications. Faceted integrators focus a high-power beam to a relatively flat-top beam with a size and shape that is equivalent to the individual facet size and shape. Traditionally, reflective integrator optics are produced by making individual faceted mirrors and then arranging them on a curved substrate. 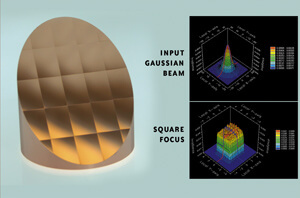 Today, however, these faceted integrator mirrors are made using advanced diamond-turning techniques. The tedious and time-consuming job of arranging individual facets on a substrate is no longer required, allowing the additional advantage of the mirror being directly water cooled. Facets are arranged on the mirror in almost any shape or form. There’s some practical limits to the size of the facets that are machined, but typical facet sizes of 2 to 8 mm are easily possible on mirror blanks up to 75 mm in diameter. Integrators work best with laser beams having poor coherence. Reflective beam integrators produce relatively flat intensity profiles. Integrated beams can be square, rectangular, or circular. Mirrors are made of copper and are ideal for high-power lasers. Focused beam sizes are relatively large -- 2 mm and above -- and ideal for welding and heat treating. Degree of integration depends on noncoherence of laser beam. Work best with laser beams having poor coherence.